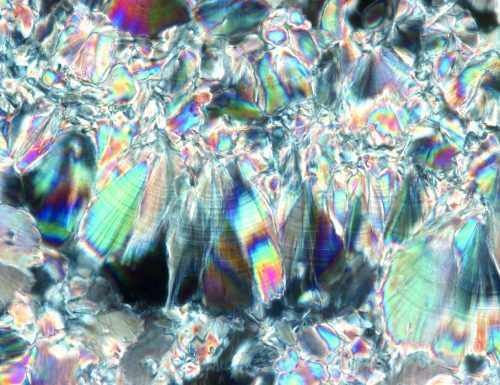 They’re not diamonds, but they are stones – kidney stone crystals – that are viewed microscopically and enhanced by polarized light. The wafer of stone shown here is only nanometers thick and was previously inaccessible with visible light microscopes. The photo is by Mayandi Sivaguru and Bruce W. Fouke, and taken as part of a collaborative of the Mayo Clinic – University of Illinois Alliance for Technology-based Health Care research project on kidney stones. Image was collected on a Zeiss Inverted Apothem Microscope at the Carl R. Woese Institute for Genomic Biology at the University of Illinois at Urbana-Champaign.